Spanish For You! . . . a TOS Review | My Journeys Through Life . . . Herding Cats In New Mexico! ← Preparing for Surgery and hosting an online benefit . . .
My children and I have been wanting to learn Spanish ever since moving here to New Mexico. 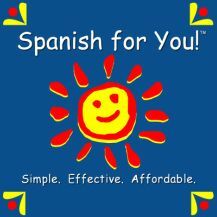 We get a LOT more exposure to the Spanish language here than we ever did living in Michigan, so when the opportunity to review Spanish For You! – Fiestas, by Debbie Annett MSEd. came up, I decided to go for it. Spanish For You! comes as a full year, theme based curriculum, centered around specific themes. There are two so far, Estaciones (Seasons), and Fiestas (celebrations), both focused at the 3rd through 8th grade range. It is my understanding that there will be more themes to come, as they are written and tested. Ms. Annett tests each one for a full school year in a teaching environment, so as to iron out any changes that may need to be made. We were given Spanish For You! Fiestas, and because we are really beginners, I chose to use the grades 3 -4. Here is a sample of Spanish For You! Fiestas for you to check out. There is a sample lesson guide to give you an idea of what you will be doing. Here are some sample worksheets for you to try. Spanish For You! offers free mini lessons for you to check out, and more free worksheets, as well! The author of Spanish For You! is Debbie Annett, MSEd. She is an Illinois State Certified Teacher with a bachelor’s degree in Spanish from the University of Illinois and a master’s degree in Curriculum and Instruction from Northern Illinois University. Ms. Annett has also studied in Seville, Spain, and has eight years of international business experience prior to becoming a teacher. She is now teaching Spanish classes for a home-school coop, in grades three through high school, along with private tutoring and after school Spanish enrichment classes. 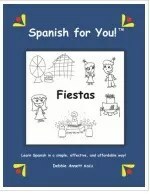 • A need for easy flow from elementary/middle school Spanish into any high school curriculum. 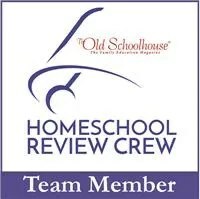 • A need for an easy to schedule program that accomplishes much learning over time without being overly burdensome. • A need for an effective curriculum that would allow families or schools to use the same book with all their students during the same school year. This saves time and money! • A need for affordability and ease of use – Materials do not need to be fancy, complicated, and expensive in order to learn. Simple, well presented and designed lessons that engage students is what ensures solid learning. • A need for audio – so many curriculums provide some audio, but many times I have heard parents and students say that they wish they could hear ALL the material in their book. • A need to be able to place students new to a program with their grade level whether they have prior Spanish learning or not. When Spanish is taught in a classroom setting, there is always the question of how to place new students without prior Spanish learning. While exploring the Spanish For You! website, I also found the author’s blog, where there is a lot of fun, informational ideas to go along with her curriculum. Ms. Annett’s suggested schedule is three to four days per week, but she has also made a point of stating that if need be, you can certainly take it slower, which is what we had to do, for a variety of reasons. However, even with the various special needs of my children, combined with the fact that our house has been hit with one illness after another for the past few months, we were able to learn some Spanish we had not known before. My kids really liked the lesson that was centered around birthdays, because my twins had a birthday while we were reviewing Spanish For You! They love having flash cards, and plan to color them before we laminate them. I really like this curriculum. From the About the Curriculum section of the website, you will find loads of information about why this is a good choice. For example, students learn HOW the language works. Students learn to speak, read, and write Spanish through interesting themes, and can do the themes in any order, rather than having to learn level by level. The curriculum is easy to use, and it’s quite easy to be flexible in your scheduling. Children of multiple ages and grade levels can use it together. Spanish For You! is very affordable. You can purchase your curriculum here, either as a complete package of all grade levels for $64.95, or you can get individual grade levels (grade 3 – 4, grade 5 – 6, or grade 7 – 8) for $39.95 each. Extra books are $12.95 each. To find out what other crew members thought of Spanish For You! Fiestas and Spanish For You! Estaciones, please click below . . .
Great review, I love all of your samples links!